Fawn, agouti, hooded, and berkshire. 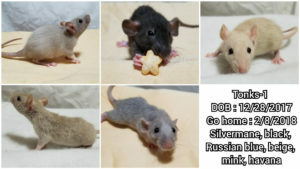 Russian blue, rex, double rex, standard fur, dumbo, standard ear, hooded, and berkshire. 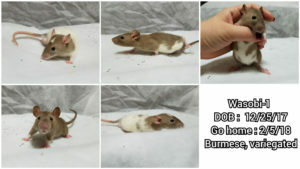 Black, agouti, hooded, berkshire, dumbo, and standard ear. Black silvermane, agouti silvermane, black, agouti, rex, berkshire, irish, unmarked. 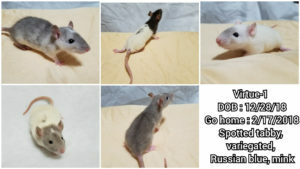 Russian blue, black, berkshire, irish, variberk. 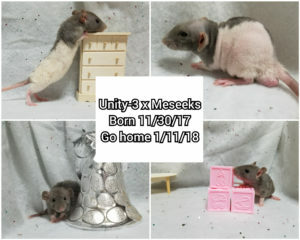 Beige, black, hooded, and berkshire. Dumbo, standard ear. Black, agouti, beige, fawn. Capped, blazed, variegated, berkshire. Silvermane, agouti, black. Hairless and standard fur. All dumbo. Siamese, marten, and Siamese hairless.